Fasting, practiced in some religions as a means of heightening spirituality, provides an additional physical benefit: weight loss. Some people combine abstinence from food with detoxification plans and green tea consumption for rapid weight loss. Although you will almost certainly lose weight on a liquid diet that includes green tea antioxidants, you may quickly regain the lost pounds. Fasting involves subsisting mainly on liquids — juices, pureed vegetables, clear broths — and detoxification cleans your digestive system through the ingestion of assorted substances or via colon irrigations. A green tea fast that included only green tea might be hazardous because green tea contains no calories. Although it would be difficult to obtain proper nutrition on any liquid fast, ones that include milk or soy protein and fruits and vegetable juices are superior to ones that are mostly sugar water. A broccoli and celery juice diet, for instance, would provide vitamins K, B6 and C as well as potassium, manganese, molybdenum and folate. If you include at least five fruits and vegetables in a juice fast, you would obtain daily allowances for these foods recommended by the United States Department of Agriculture. If you made two fruit smoothies with 2 cups of skim milk, you would also meet your daily needs for dairy products. Include 4 cups of milk and you could also meet your protein needs. You probably won't meet your needs for grains and fats on a liquid diet, but the absence of cereals and whole grain fiber won't harm you on a short-term fast, according to "The New York Times." Adding green tea to a fast or detoxification plan may help you lose fat, particularly in your abdomen. 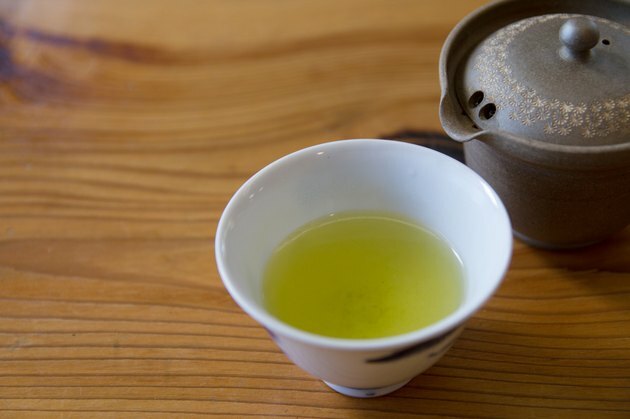 Men who drank green tea decreased their waist sizes substantially and lost more overall body weight than men who drank green tea in a study conducted by Kevin Maki, president of a private United States research firm, and published in the February 2009 "Journal of Nutrition." The antioxidants in green tea boost metabolism and may help you lose an extra 1 to 5.5 lbs in three to 24 weeks, according to the "Los Angeles Times." The amount of weight you would lose on a green tea fast diet would depend on the number of calories you consume. A juice fast might provide 500 to 800 calories. If you are a woman who needs 2,000 calories a day to support your current weight, you could expect to lose 3 lbs. in a week if your fast provided 500 calories and 2.4 lbs. of fat in a week if your fast provided 800 calories. The weight-loss expectations are based on the calculation that 3,500 calories equals a pound of fat. Unsweetened green tea is calorie-free. Although green tea boosts metabolism, it would unlikely produce noticeable weight loss in a week or less. And it could be dangerous to remain on a fast for more than a few days. Extended fasting can damage your heart, kidney and liver, according to "The New York Times." Some people experience substantial weight loss while fasting, but this is typically due to a loss of water or, if you are also on a detoxification plan, to purging of colon wastes. Fasting may slow your metabolism, making you susceptible to quickly regaining weight as soon as you resume normal eating patterns.